SAITAMA, Japan (AP) It took less than three minutes for Floyd Mayweather to knock down his Japanese kickboxer opponent Tenshin Nasukawa three times in a totally one-sided bout of exhibition boxing on New Year's Eve. Nasukawa's father threw in the towel after 140 seconds of the first round on Monday as his 20-year-old son bravely teetered around the ring trying to get up. It was a quick and definitive victory for the 41-year-old American. Mayweather was gracious in victory, hugging the weeping Nasukawa and calling him "still a great champion." 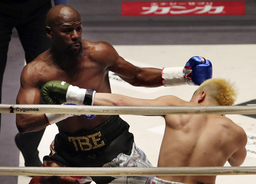 Nasukawa, however, barely landed a clean punch against the vastly more experienced Mayweather. The rules for the three-round contest - organized by The Rizin Fighting Federation and held at Saitama Super Arena on the northern outskirts of Tokyo - were no kicking allowed and no official record of the match. Mayweather said: "Tenshin is still undefeated. I'm still undefeated." Mayweather has won all 50 of his pro fights, while Nasukawa has an undefeated record in kickboxing and mixed martial arts. "It's all about having fun," Mayweather told reporters after the fight, praising Nasukawa as a "young hungry lion." The Mayweather-Nasukawa bout culminated an evening of more than a dozen fights, streamed by FITE for a fee, but not in the U.S. Fuji TV was the broadcaster in Japan. Mayweather, who hadn't fought since beating UFC star Conor McGregor more than a year ago, said he was retired and came to Tokyo to give an opportunity to a younger fighter like Nasukawa. "I told Tenshin to `hold your head up high,'" Mayweather said. Nasukawa said after the bout that he was grateful for the experience and that he had learned a lot. Fans - and possibly Nasukawa himself - appeared taken back that Mayweather showed little mercy in the exhibition. "He is first class," Nasukawa said.